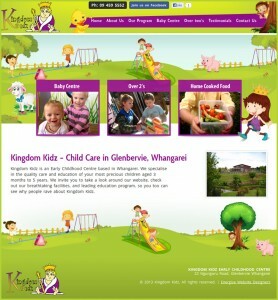 Kingdom Kidz was established in 2007. Our centre is situated on a beautiful 3 acre rural property in Glenbervie, on the outskirts of Tikipunga [approx 10 mins. from Whangarei CBD]. We have 2 units, our Baby Centre for 3 months old to 2 & a half year olds and our Over 2 Centre for 2 & a half year olds to 5 year olds. Business founder and owner Lisa Tahitahi was struggling to find a quality childcare facility in Whangarei that catered for what she specifically wanted for her own children. Driven by this quest for quality Lisa, with help from her family established Kingdom Kidz, and has successfully filled a niche in the industry, i.e. delivering a high standard of education, top quality nutritional menu and caring, nurturing & involved staff. Parents have often referred to our centre as a home away from home with staff who operate as a family team. The property itself is also home to a wide selection of animals and native wildlife such as rabbits, chickens, ducks, pukekos, a pig, fish, eels and even a turtle. All meals and snacks, sunscreen, wipes for nappy changes, toothbrush and toothpaste.